Among the offerings at Dublin’s Bohemian Picture for the first three days of the week beginning 19 March 1917, was footage of the Tsar of Russia; Dublin Evening Mail 19 Mar. 1917: 2. 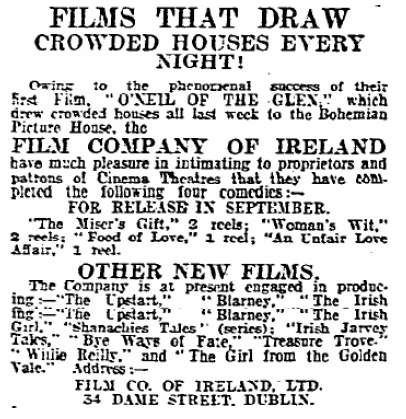 “Things are very quiet in Dublin film circles just now,” observed the columnist of “Screenings: Kinematograph Notes & News” in Dublin’s Evening Telegraph on St. Patrick’s Day 1917, “but some big things are on the way.” The seeming quite may have been deceptive because big things were already underway in the shape of social upheaval in Russia, which Irish newspapers had first called a revolution the previous day. This was an event that was momentous even in a time of war, and cinema would, at the very least, provide moving images for Irish people to picture these developments. 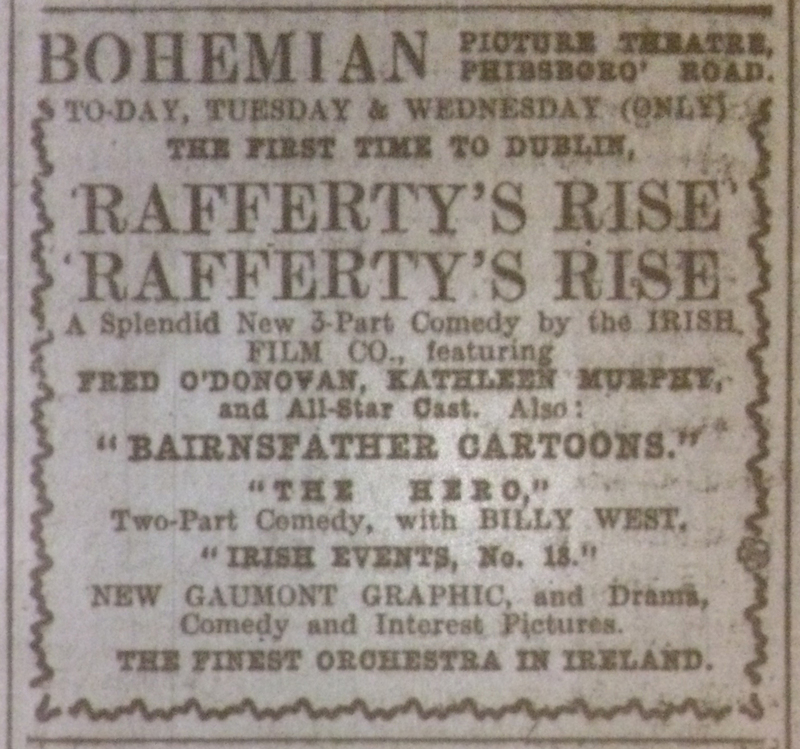 On 19 March, Dublin’s Bohemian Picture Theatre featured the “Latest Exclusive Pictures of The Czar of Russia,” and the Dublin Evening Mail reviewer thought they “should prove a source of great attraction” (“Bohemian Picture Theatre”). Despite this, no reviews of the films appear to exist by which public reaction to them might be judged. In any case, while an undoubtedly old film of the Tsar might pique the curiosity raised by unfolding events, it was unlikely to have satisfied the desire to witness recent developments. But Dublin was not alone in this. “Russian pictures have been going strong in London since the Duma won through to victory,” the “Screenings” writer noted. “And now arrangements have been made to show in the Russian provinces a kinematograph film of the revolution in Petrograd” (“Screenings,” Mar. 24). The shadow of revolution was also closer to Ireland than this. The Irish administration feared that the first national day after the Easter Rising would occasion some “big things” in the shape of subversive activity and as a result, had put all public buildings in the city under military control for St. Patrick’s Day (“Patrick’s Day”). However, in stark contrast to occurrences in Russia, the main leaders of Ireland’s rebellion had been executed, and many rank-and-file participants remained in prison, a fact raised in speeches at Westminster comparing Ireland and Russia by such Irish MPs as John Dillon and Joseph Devlin (“Broken Pledges”). 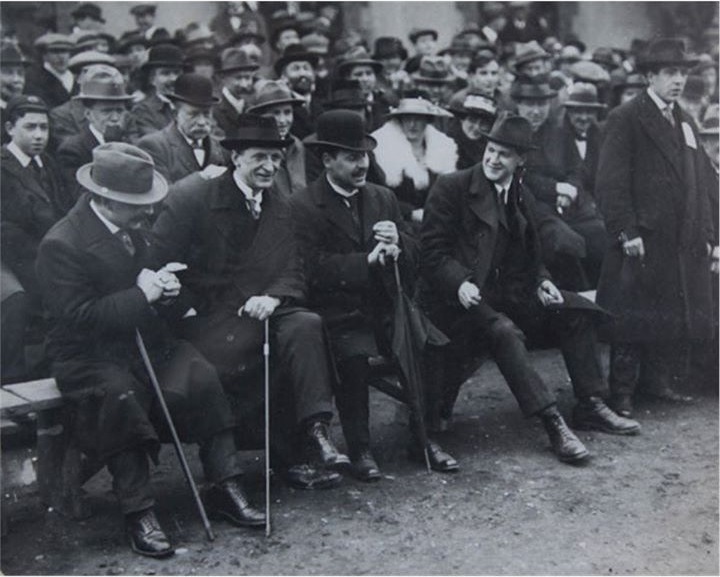 Laurence O’Neill (centre with moustache) attending a GAA match at Croke Park, c.1919, in the company of Arthur Griffith, Eamon DeValera and Michael Collins. Wikimedia Commons. 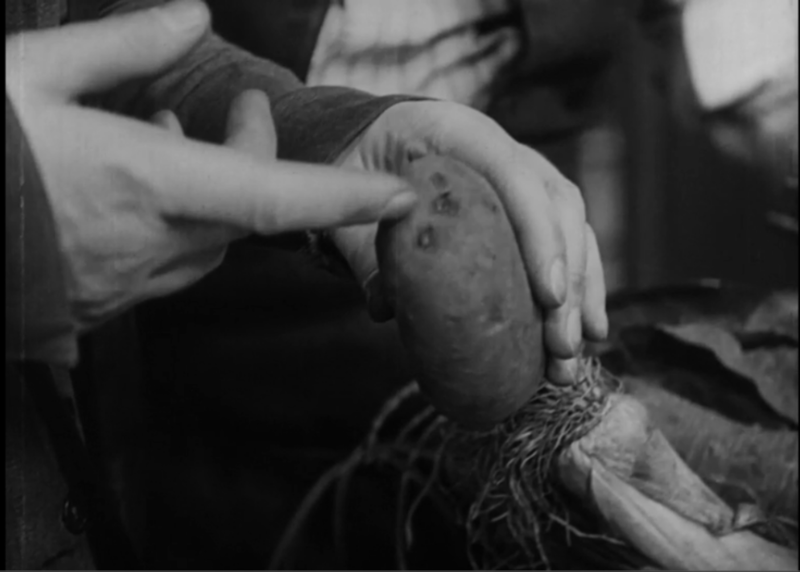 While the question of Irish political prisoners was being discussed, many believed that a scarcity of food was a more immediate potential cause for social unrest. Earlier in March, before the strikes and demonstrations in Russian had become a revolution, Dublin’s lord mayor, Laurence O’Neill, had invoked the French Revolution to warn of the dangers in the city caused by “unemployment and the scarcity and inflated prices of foodstuffs.” “[O]ne of the principal causes of the French Revolution was the luxury of the upper classes and the poverty of the poor,” he observed, “and the lesson of that Revolution was that no matter in which age the authorities or upper classes ignored their duties to the poor, there was bound to be discontent” (“Lord Mayor”). The first two workers’ budgets from the Leo Guild; Evening Telegraph 24 Feb. 1917: 1. You see people happy, contented: something has come to break the monotony of their lives; to give them a glimpse of the wonders of the world; to bring sentiment and poetry into drab and barren existences, and who shall say what hearts have been touched, appealed to and changed “in the shadows”? Eric Campbell, Charlie Chaplin and Edna Purviance in The Count (US: Lone Star, 1916). Chaplin was also a favourite among the children of the Irish in Britain. 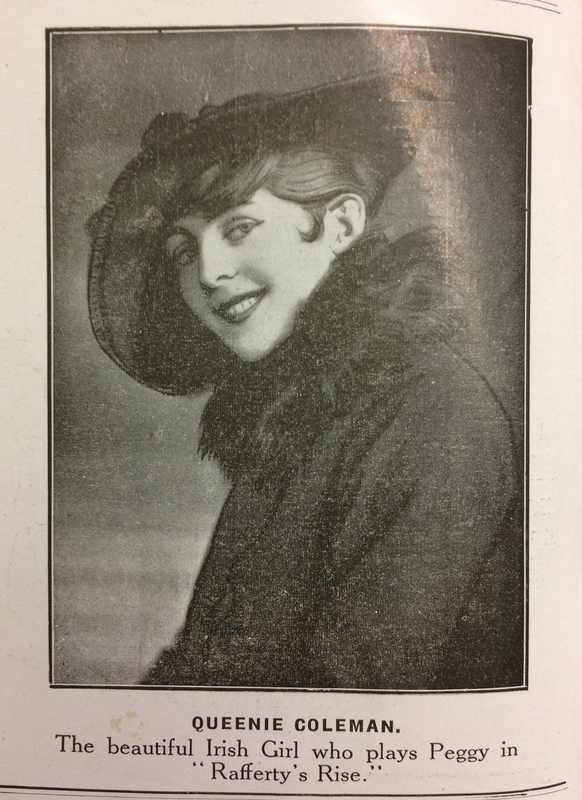 A 12-year-old Irish girl was one of the three London schoolgirls who in mid-March 1917 appeared before the Cinema Commission, a body formed by the National Council of Public Morals that began its inquiry into cinema’s public influence in January 1917 (“Mr. Goodwin’s Striking Figures”). When asked about the kinds of films they liked best, the girls chose Westerns and Chaplin comedies. 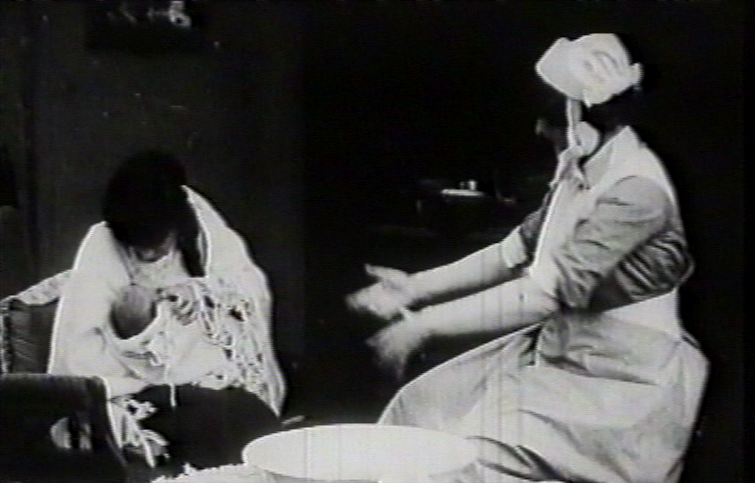 However, they and their friends were not so enthusiastic about newsreels. “‘Sometimes when they have a Topical Budget,’ confessed one of the girls, ‘the Boys get up and go out’” (“At the Pictures”). In the three-day run up to St Patrick’s Day, the Bohemian showed the newly released Irish film The Eleventh Hour. Evening Telegraph 15 Mar. 1917: 2. 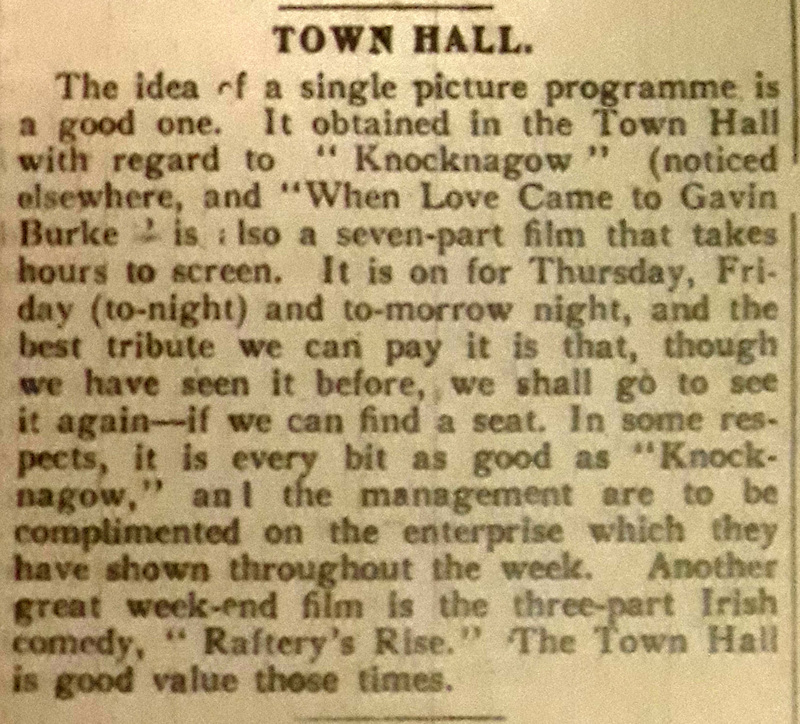 As well as the Irish-American Rosary, picture-house managers also followed the well-established practice of choosing Irish-shot films for St Patrick’s Day. In 1917, some of these were more authentically Irish shot than others. From 15-17 March, the Bohemian showed the already released The Eleventh Hour on a bill topped by Cleansing Fires. 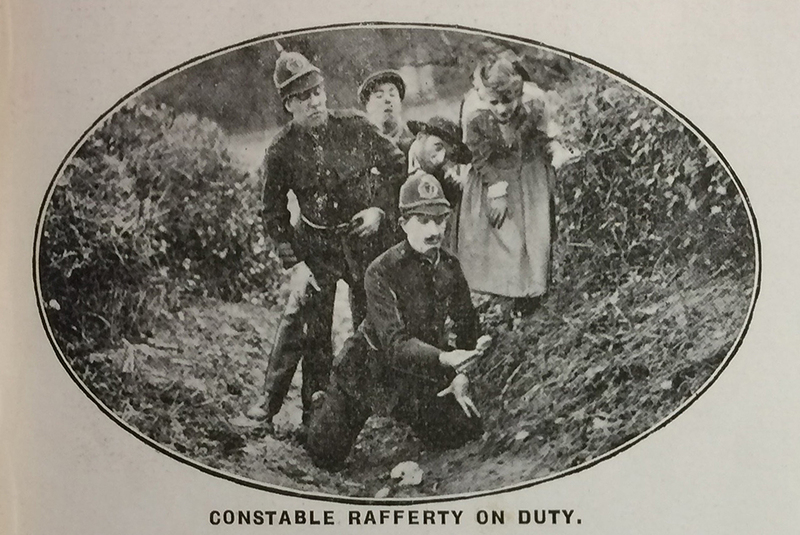 Cleansing Fires is sometimes mistaken as one of films made by the Film Company of Ireland (FCOI) in 1916, but FCOI merely controlled the rights of this film. 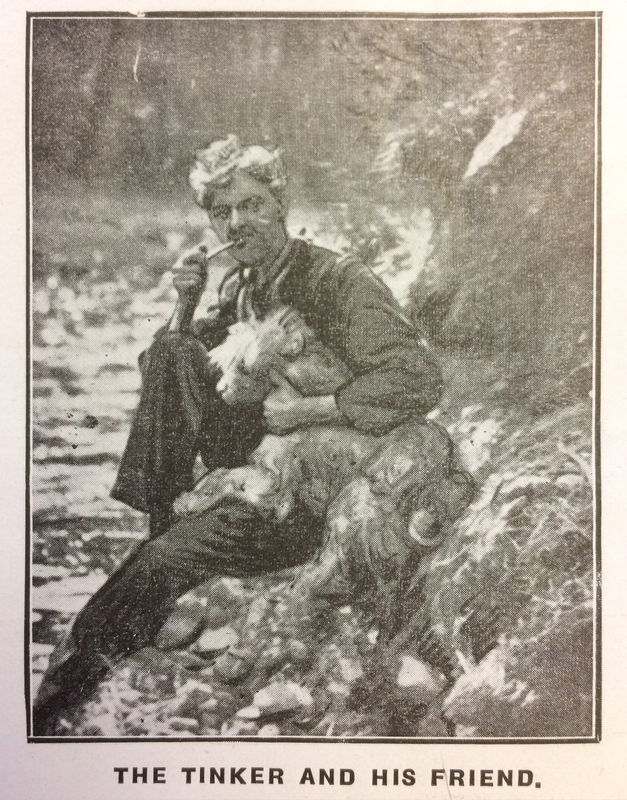 Film Fun July 1916: np. 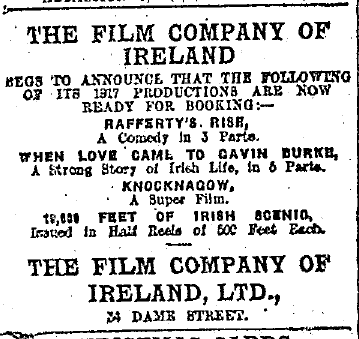 All in all, it seems things were not as quiet as they may have seemed in Irish cinema in March 1917. “At the Pictures: What School Girls Like.” Evening Telegraph 20 Mar. 1917: 2. Blaisdell, George. 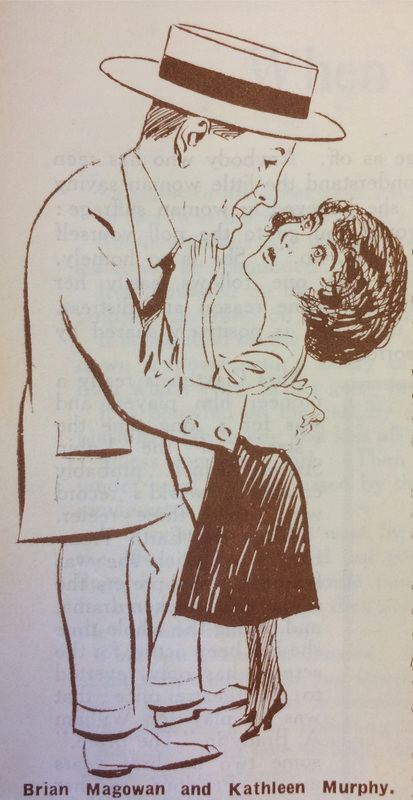 “‘The Innocent Lie’: Valentine Grant Makes Good in Her Debut in Famous Players Five-Part Subject.” Moving Picture World 20 May 1916: 1349. 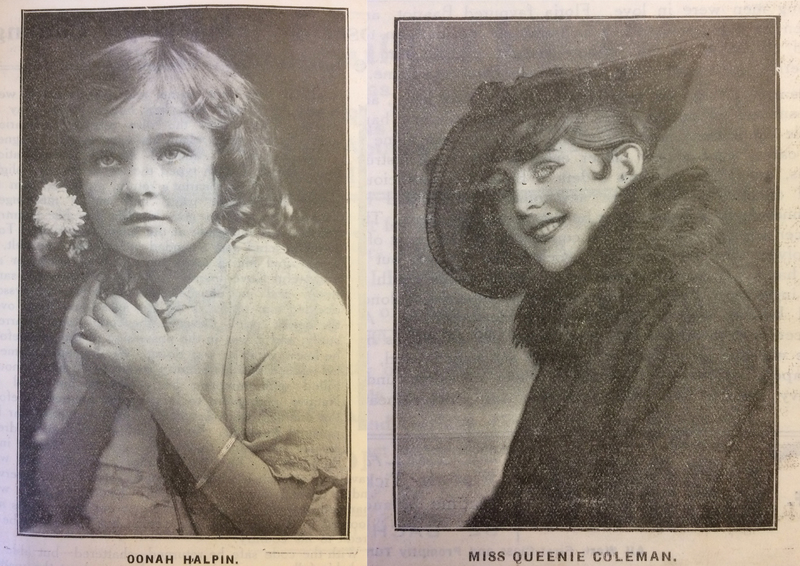 “Bohemian Picture Theatre.” Dublin Evening Mail 20 Mar. 1917: 5. “Broken Pledges—Empty Threats: Mr. Dillon’s Indictment of the Government.” Freeman’s Journal 21 Mar. 1917: 5. “Father Mathew Hall: ‘Are Irish Catholics Good Citizens.’” Freeman’s Journal 18 Sep. 1912: 5. 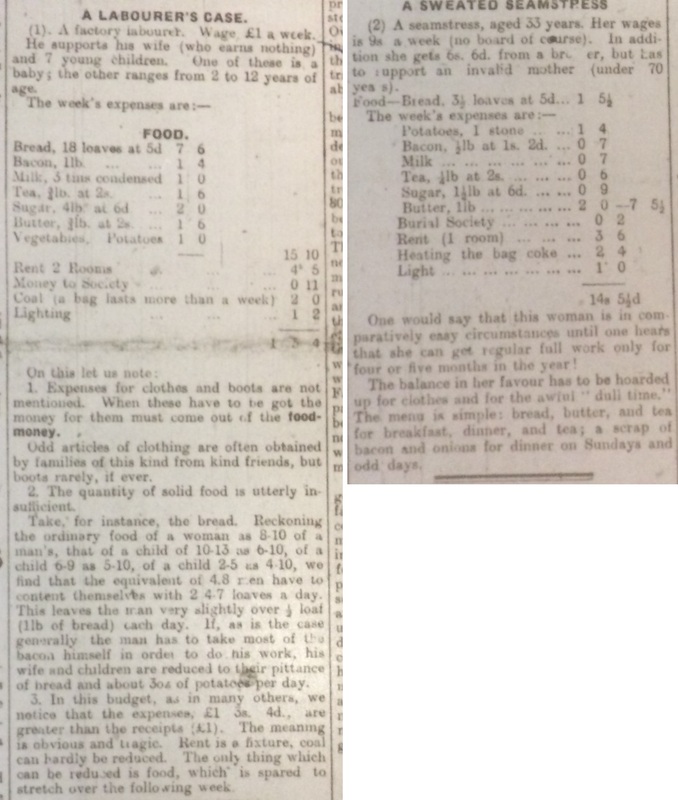 “How the Poor Live: Typical Budget: A Crying Grievance: Result of Leo Guild Inquiry.” Evening Telegraph 24 Feb. 1917: 1. “The Life of the Poor: More Leo Guild Budgets: A Pressing Problem.” Evening Telegraph 17 Mar. 1917: 4. “Lord Mayor and the Distress in the City: Gravity of the Situation Stated in Plain Terms.” Evening Telegraph 12 Mar. 1917: 1. De Maistre, Stephanie. “In the Shadows.” Irish Limelight 3:1 (Mar. 1917): 4. “The Masterpiece Irish Week.” Evening Telegraph 16 Mar. 1915: 6. “Mr. Goodwin’s Striking Figures: Evidence of Film Industry’s Magnitude: First Sitting of Cinema Commission.” Bioscope 11 Jan. 1917: 96. “Patrick’s Day: Quiet Observance in Dublin.” Evening Telegraph 17 Mar. 1917: 1. “Screenings: Kinematograph Notes & News.” Evening Telegraph 17 Mar. 1917: 5; 24 Mar. 1917: 5. 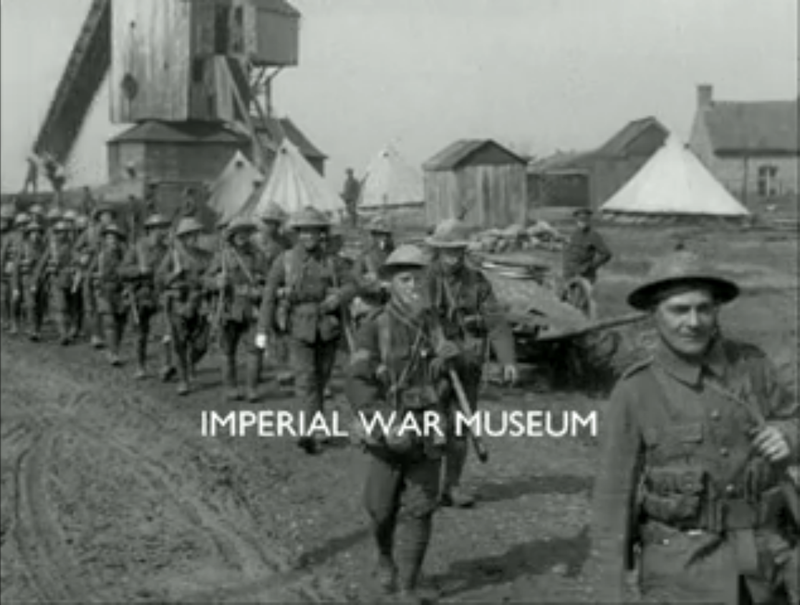 Framegrab from The Fight at St. Eloi (Britain: British Topical Committee for War Films, 1916); Imperial War Museums. We are happy to believe that the precaution was unnecessary. The power of the pictures has never yet been used in this country for the furtherance of disloyal or anti-British objects. It has, on the other hand, not seldom been employed with the utmost success in patriotic causes. Nevertheless, the British government did see a reason for tighter legislative control of cinema in pursuit of the ideological goal of promoting patriotism, unanimity and support for recruitment in the context of a lengthy and costly war. The economic need to fund the war through increased tax had most directly affected cinema through the recently introduced Entertainment Tax. 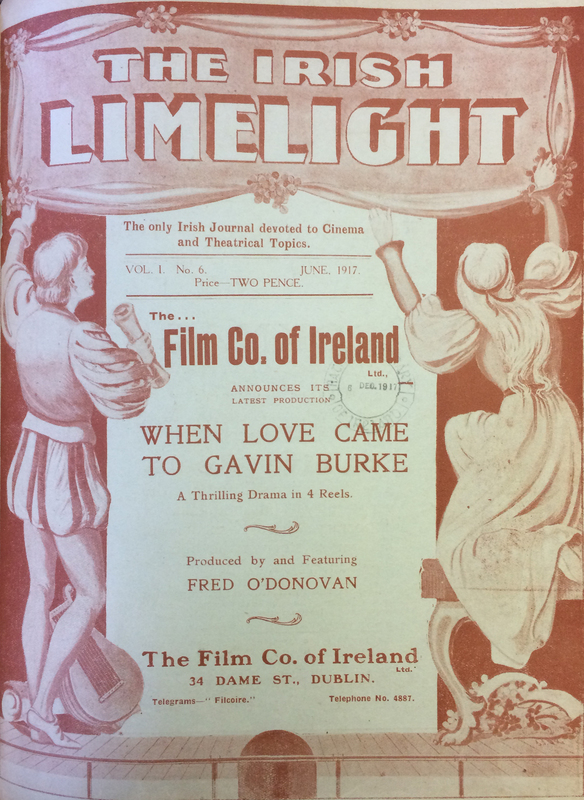 In many ways, cinema in Ireland in June 1916 looked like a mature industry, regulated by these laws, but also highly cognizant of and largely aligned with the London-based trade. 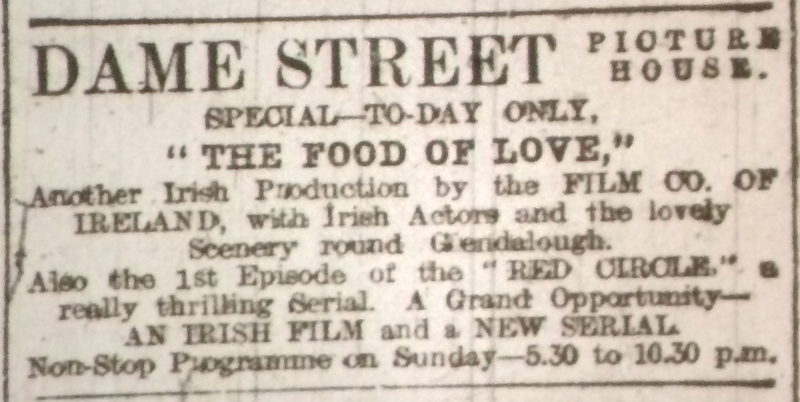 Even Ireland’s laggardly film production showed considerable development when the Film Company of Ireland press-showed its first production, O’Neil of the Glen, on 29 June at Dublin’s Carlton Cinema (“Irish Film Production”). 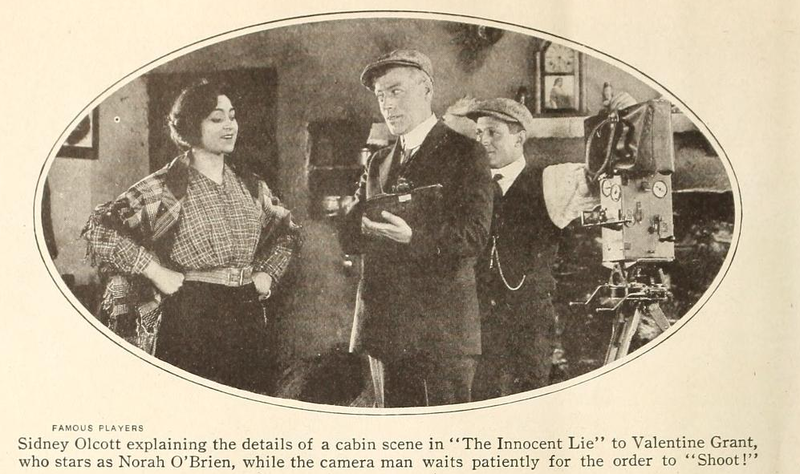 The Bioscope was one of the ways in which this alignment was achieved, and although it was certainly read in Ireland, members of the Irish cinema trade might have been less confident of the claims of this editorial. 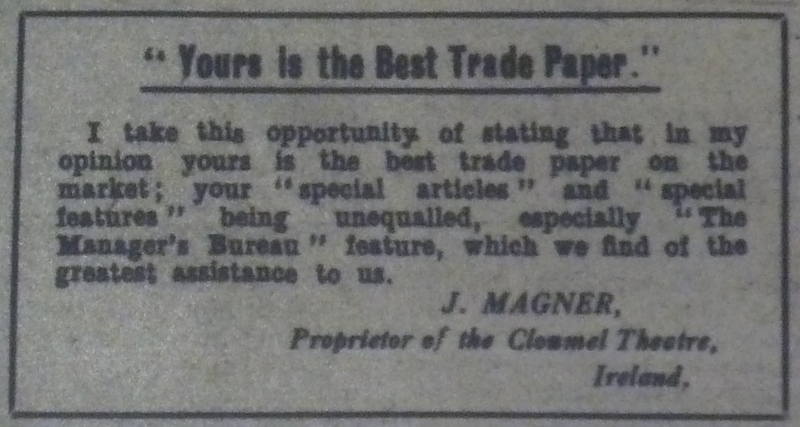 In the same 1 June issue, the journal’s “Trade Topics” column published the assertion of J. Magner of the Clonmel Theatre that the Bioscope was the best of the cinema trade papers. 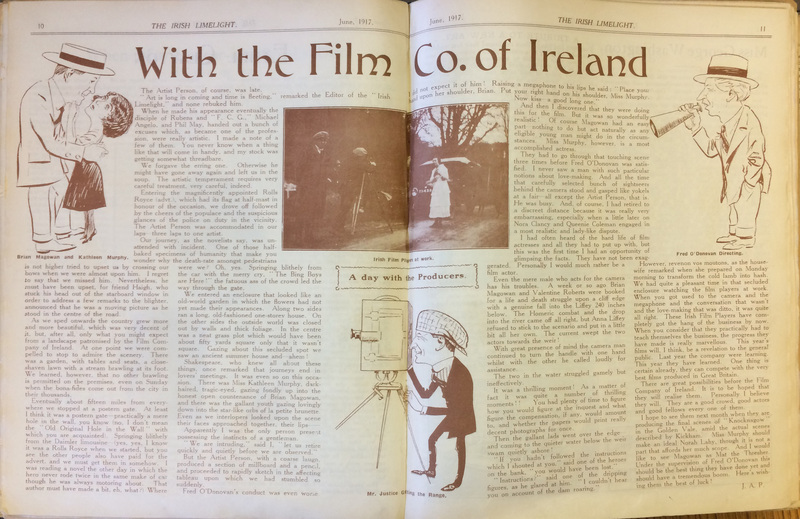 And in 22 June issue, Irish columnist “Paddy” informed readers that the Bioscope was available at Mrs Dunne’s shop in Dublin’s Brunswick Street – close to the Queen’s Theatre, Norman Whitten’s General Film Supply, distributor Weisker Brothers, and other cinema businesses. In the aftermath of the Easter Rising, however, it was questionable to what the Irish population at large was loyal. Support for the war still dominated the mainstream Irish press, but antiwar and pro-republican sentiments were becoming less marginal. By June, some theatres and picture houses anxious to maintain displays of their loyalty to the Crown – and by extension, that of their patrons – encountered protests. The large Theatre Royal had been one of the first places of amusement to open after the Rising, when it had offered British Army propaganda films. This did not, however, mean that its audience could all be considered loyalists. On 26 June, for instance, William Charles Joseph Andrew Downes, a church decorator living at 15 Goldsmith Street, Dublin, was arrested for riotous behaviour during a live show at the Theatre Royal. He had shouted abuse related to the Boer War at a uniformed soldier who had responded to a magician’s call for a volunteer from the audience (“Scene in City Theatre”). The Boer War of 1899-1902 had been extremely divisive in Ireland, with popular support for the Boers’ stand against the British Empire extending from fiery speeches by Parnell’s Irish Parliamentary Party in Westminster to attacks on British soldiers in the streets of Dublin, and it was directly linked to the Rising in the person of executed leader and former Boer Irish Brigade major John McBride (Condon). As Downes was being escorted out the door of the Theatre Royal, he drew attention to the Irish republican badge he was wearing – a display of solidarity with the Easter rebels – and suggested that it was the reason he was being expelled. Downes’ outburst could not be completely dismissed as the actions of a drunk – the arresting constable described him as neither drunk nor sober but “half-and-half” – and it was not isolated. The previous week, seven young people between the ages of 17 and 29 – four men and three women – had been charged in Dublin’s Police Court with offenses under the Defence of the Realm Act and with assaulting the constables who had attempted to seize the green flag at the head of a procession of 400 republican supporters that had been followed through the city centre by a crowd of around 2,000 (“Amazing City Scenes”). The crowd had also shouted republican slogans and booed and groaned passing soldiers. The mass arrests and deportations in May had failed to quell advanced nationalist activism that was now consciously identifying itself as republican. Dublin Evening Mail 19 Jun. 1916: 2. This republican riot on Dublin’s streets provided an immediate if unacknowledged context for press commentary on the educational value of the official war films. “The boys of the future will have many advantages over the boys of the past,” observed the Dublin Evening Mail’s “Town Topics” columnist. “They will learn by picture-houses as well as by paradigms. It has been said that there is no Royal road to learning. There may be a Theatre Royal road, however” (“Town Topics”). 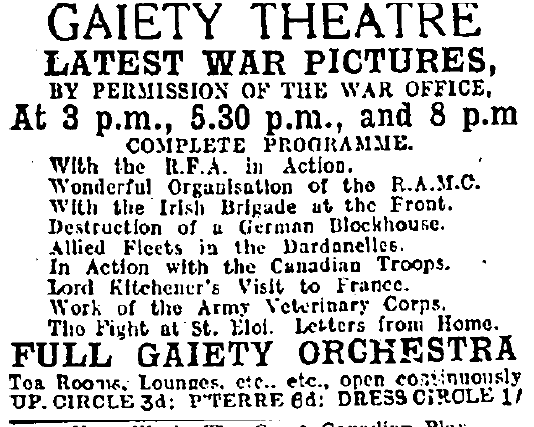 Official war films at the Gaiety; Evening Herald 14 Jun. 1916: 2.
history was taught me not without tears. The boys of the future will learn of the great war at the picture-palaces. 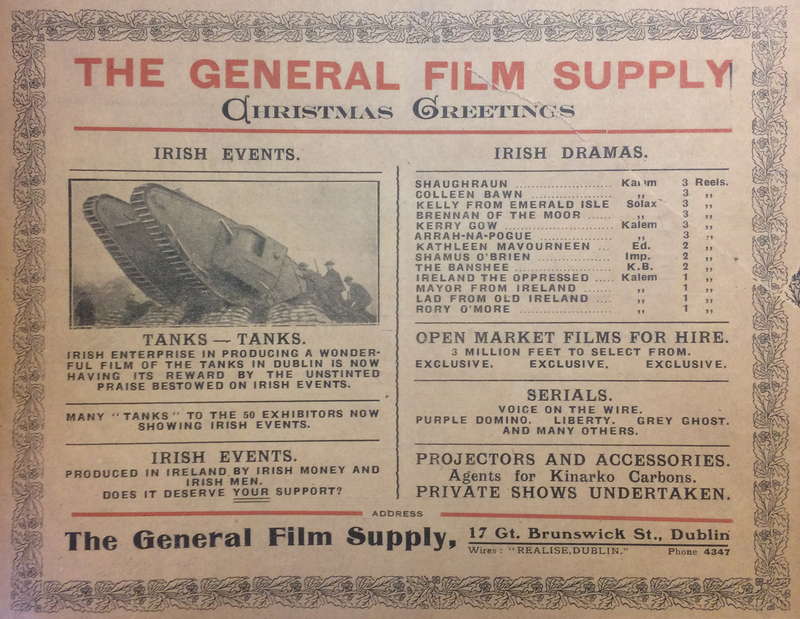 I saw some of the official war films last week at the Gaiety Theatre. I saw the Irish regiments marching to Mass. I saw the heavy artillery attacking a German block-house. […] I saw our men in the trenches, preparing to seize the crater of a mine explosion. I saw them lobbing bombs like cricket balls at the enemy. Then I saw them – gallant Canadians at St. Eloi – fix bayonets and out over the parapet to charge across No Man’s Land and leap at the foe. Who would read the dull chronicles of Caesar of Livy after that? 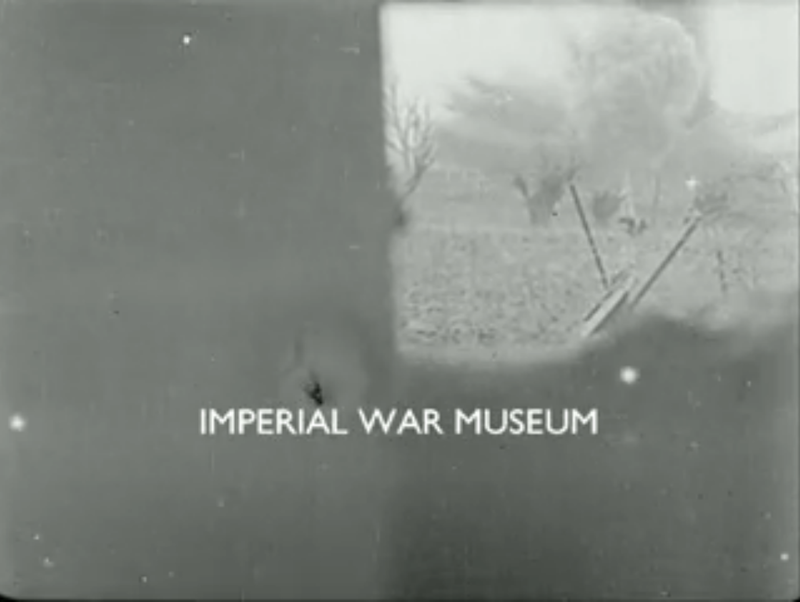 Framegrab from Destruction of a German Blockhouse by 9.2 Howitzer (Britain: British Topical Committee for War Films, 1916); Imperial War Museums. 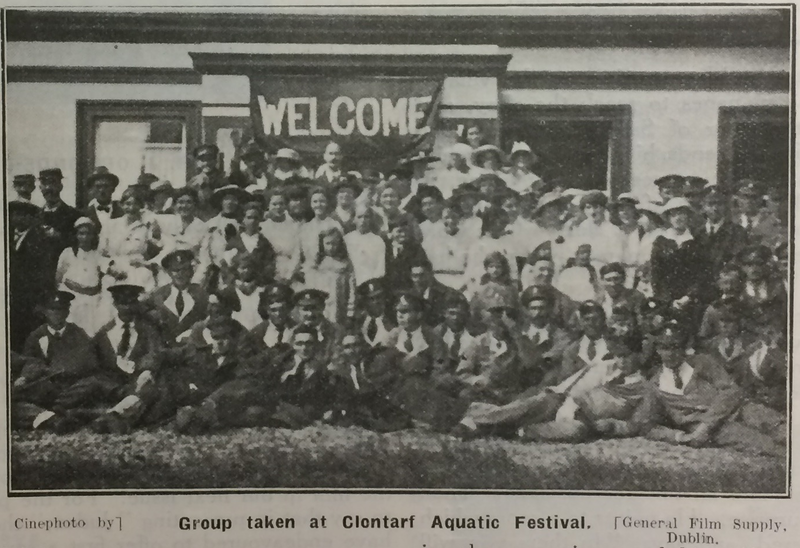 Other press coverage of the Gaiety shows gives further details of how this new history was presented and received. 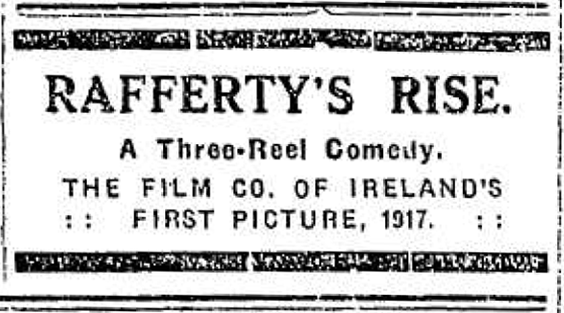 The choice of a large “legitimate” theatre such as the Gaiety rather than in a picture house associated the films with a site of serious cultural production aimed at a discerning audience. On the other hand, the Gaiety adapted picture-house exhibition practices in showing the films at three shows a day beginning at 3pm. 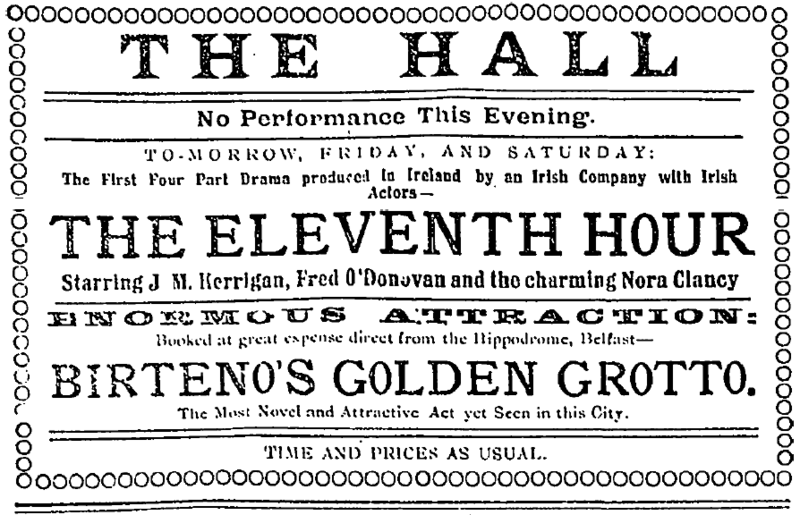 “[T]he Gaiety Theatre opens a practically new chapter in its career,” the Freeman’s Journal commented, “by the fact that the attraction is not the familiar drama, musical or otherwise, but the production of a series of official war pictures which are, beyond all doubt, of transcendent interest” (“Amusements”). “In imagination,” observed the Irish Times, “one may see Irish soldiers at work and play, the Connaught Rangers and Munster Fusiliers amongst them, and Captain Redmond is seen leading his company to the front lines” (“Public Amusements”). Similar to other entertainments at the theatre, “a most excellent musical accompaniment is supplied by the Gaiety orchestra” (“Amusements”). Although music might contribute to the ease with which these images could be perceived, the musical director would presumably have had to be careful to avoid evoking not tears of schoolboy struggle but those of poignant loss among audience members with relatives and friends in France. More chapters of this history that could – a least theoretically – be assimilated without tears, were on the way. “At the General Headquarters of the British Army in France,” reported the Dublin Evening Mail on 22 June, “there was last night exhibited before a large gathering of distinguished officers and their guests the latest series of the official war films, which in due course will be presented to the public at home and to neutral Powers, amongst which the desire to learn what our troops are really doing is unquestionable very keen” (“Pictures Taken at the Front”). This first run before an expert military audience could not, however, guarantee how resistant audiences in Ireland or elsewhere might react. The Irish Catholic Church seemed to also believe that the cinema could not easily be destroyed and should therefore be, if not utilized for its own purposes, at least shaped by its ideology. 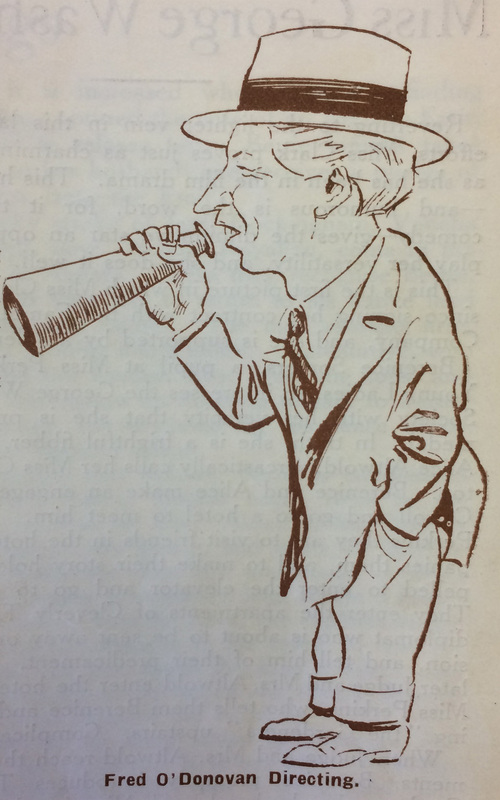 With the appointment in June 1916 by Dublin Corporation’s Public Health Committee of Walter Butler and Patrick Lennon as film censors, a milestone was reached in the church’s campaign to introduce local censorship that would reflect a distinctly Irish Catholic sensibility (Rockett 50). 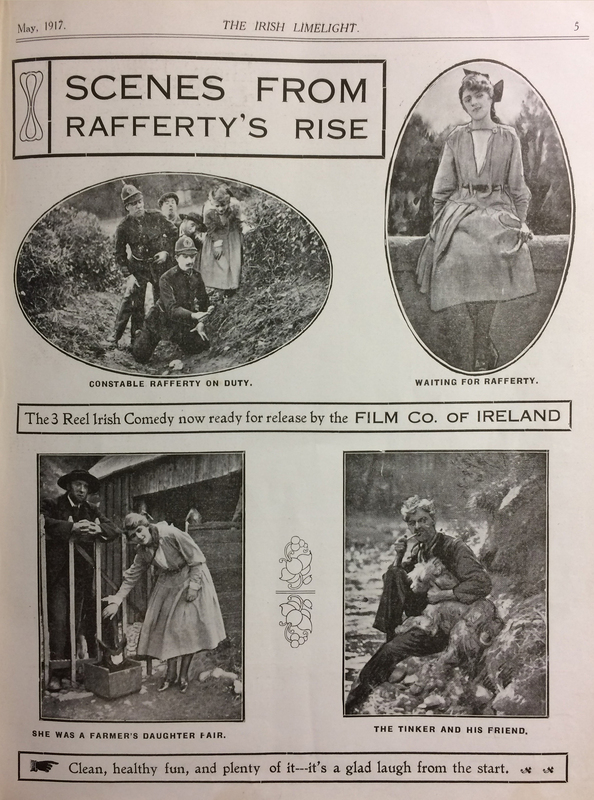 Films shown in Ireland already bore the certificate of the British Board of Film Censorship, which had been established by the film trade as a form of self-regulation to avoid government-imposed censorship. Even as Butler and Lennon were being appointed, the British industry was discussing renewed government determination to introduce official censorship. 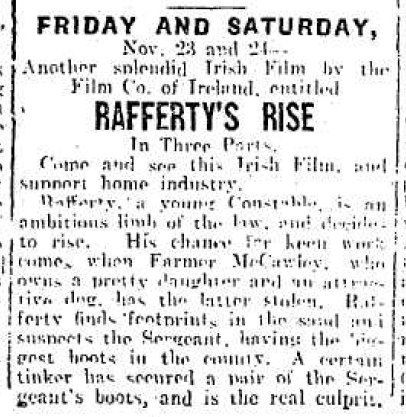 Among the cases cited that raised this issues in London was the banning of A Tale of the Rebellion, a film about the Easter Rising that showed an Irishman being hanged (“London Correspondence”). 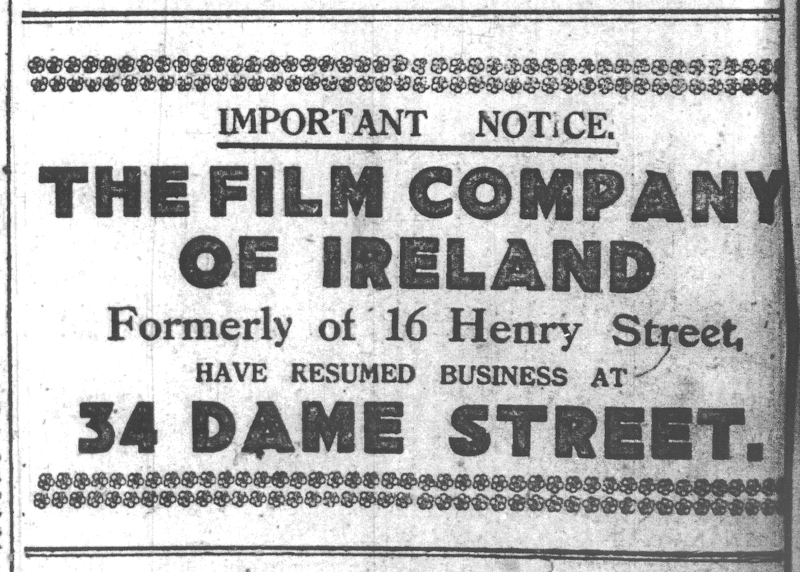 Even as they announced the introduction of censorship in Dublin, however, the Irish Vigilance Association (IVA) expressed impatience with the lack of urgency demonstrated by the Corporation in appointing censors (“Film Censors for Dublin”). Musical attractions at the Pillar; Dublin Evening Mail 1 Jun. 1916: 2. 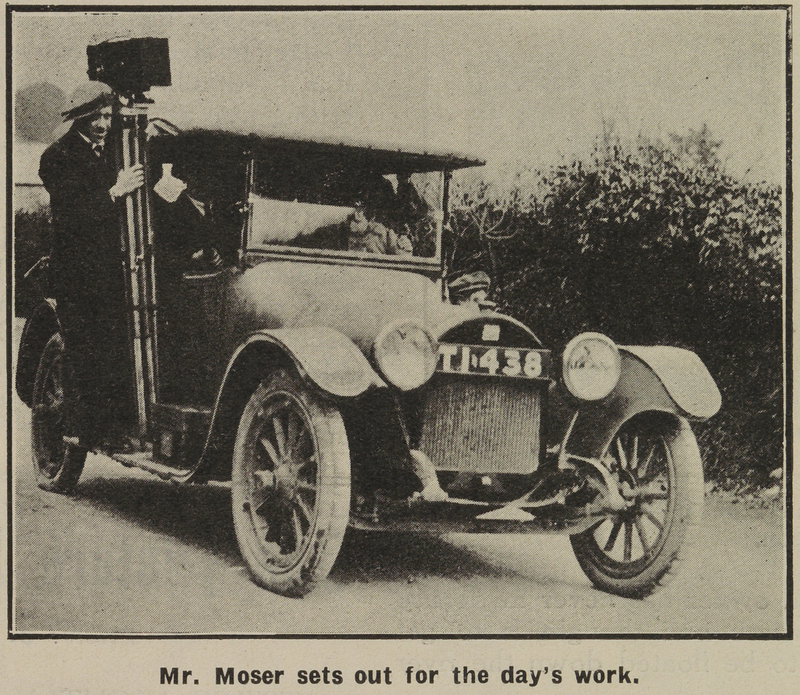 From the IVA’s perspective, censorship was increasingly urgent given cinema’s growing appeal for the middle class, epitomized by improvements to cinematic music in June 1916. Three Dublin picture houses led the musical field: the city-centre Pillar and Carlton and the suburban Bohemian. 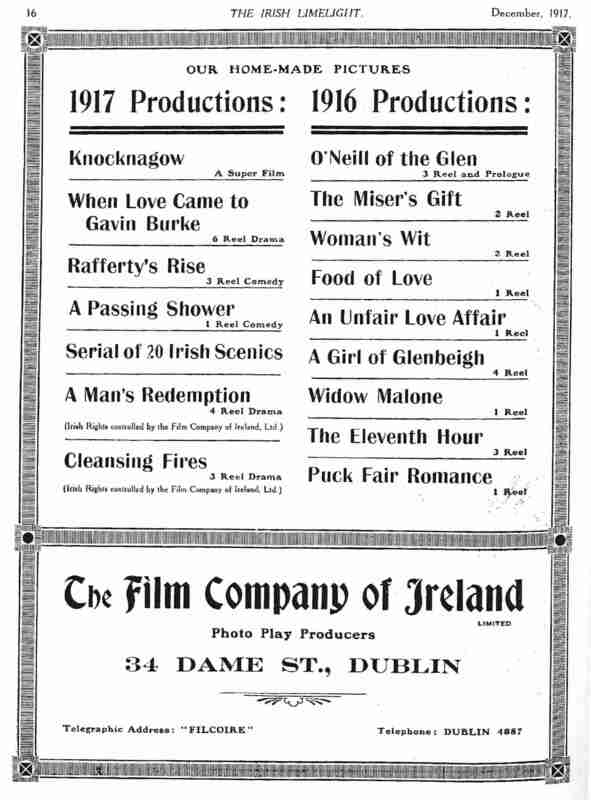 Reviewing the Pillar at the end of June, the Irish Times revealed that its “orchestra including such favourites as Mr. Joseph Schofield, Mr. Harris Rosenberg, Mr. H. O’Brien, Miss Annie Kane and Mr. S. Golding, continue[s] to delight large audiences” (“Pillar Picture House”). Just a few doors away from the Pillar on Sackville/O’Connell Street, the Carlton boasted in Erwin Goldwater an internationally renowned violinist as its orchestra leader and soloist. Dublin Evening Mail 10 Jun. 1916: 2. The Bohemian, however, outdid both of these when it engaged Achille Simonetti. 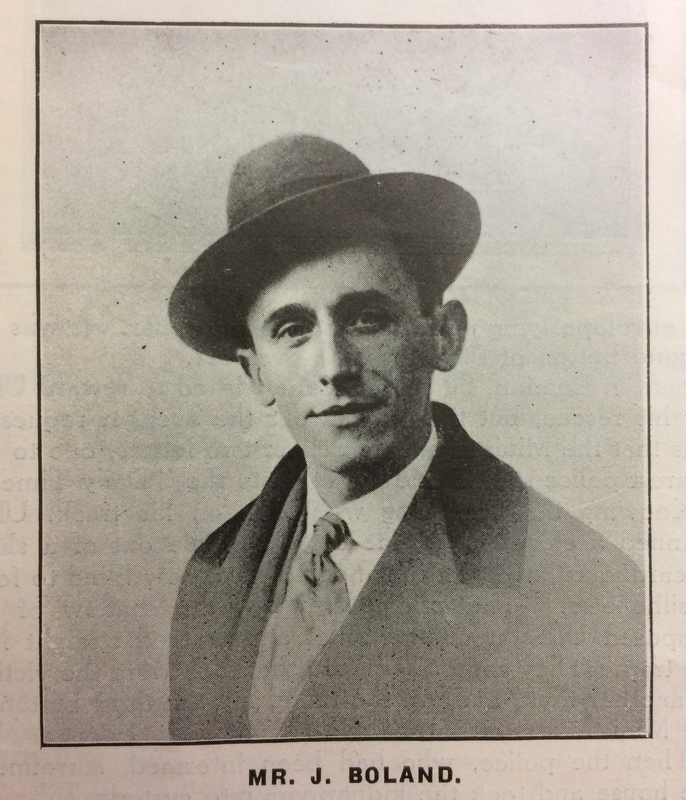 “Dubliners will keenly appreciate the enterprise of the management of the Bohemian Picture Theatre in permanently engaging the services of one of the most noted violinists of the day in the person of Signor Simonetti,” the Dublin Evening Mail argued. “Henceforth Signor Simonetti will act as leader of the Bohemian orchestra – which has won such a wide repute – and will give solos, as well as Mr. Clyde Twelvetrees, Ireland’s greatest ’celloist” (“Play’s the Thing”). 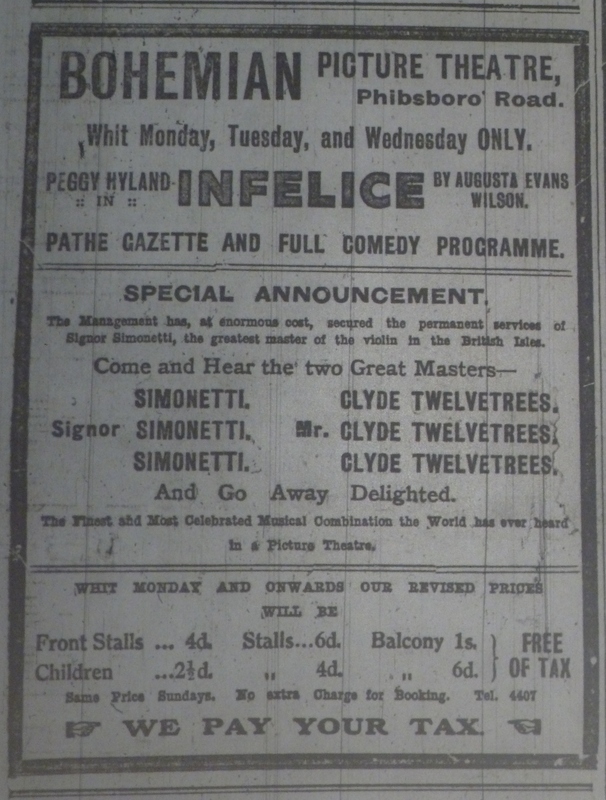 Simonetti debuted alongside Twelvetrees at the Bohemian on Whit Monday, 12 June 1916, when the bill was topped by Infelice (Britain: Samuelson, 1915), based on a novel by Augusta Evans-Wilson and starring Peggy Hyland. And if this was not enough to draw a large audience, the Bohemian announced that it would revise its pricing back to pre-Entertainment Tax rates, adding the line “We Pay Your Tax” to future advertisements. No ordinary musicians need apply to Bangor’s Picture Palace; Irish Independent 9 Jun. 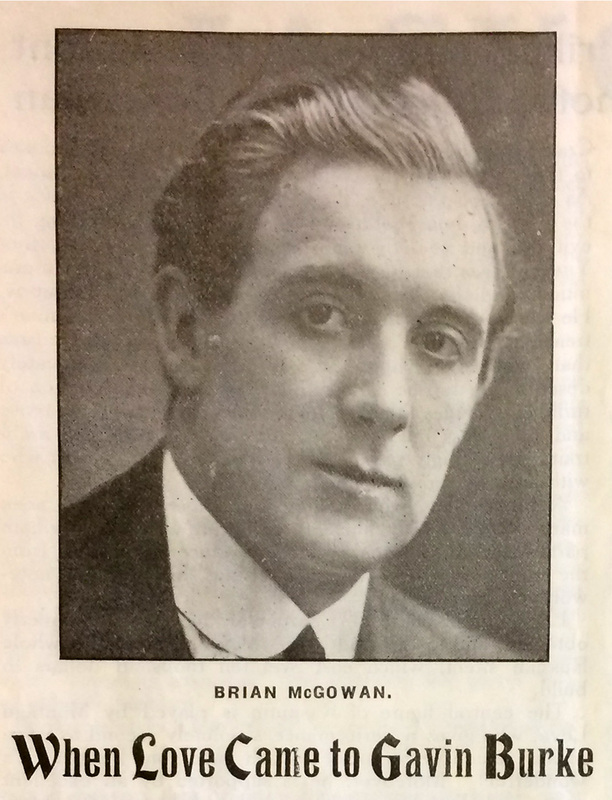 1916: 6. Although the official war films were not shown at the Bohemian, music of this kind could certainly play a role in assimilating the new tearless history. “Amazing City Scenes.” Dublin Evening Mail 19 Jun. 1916: 3. 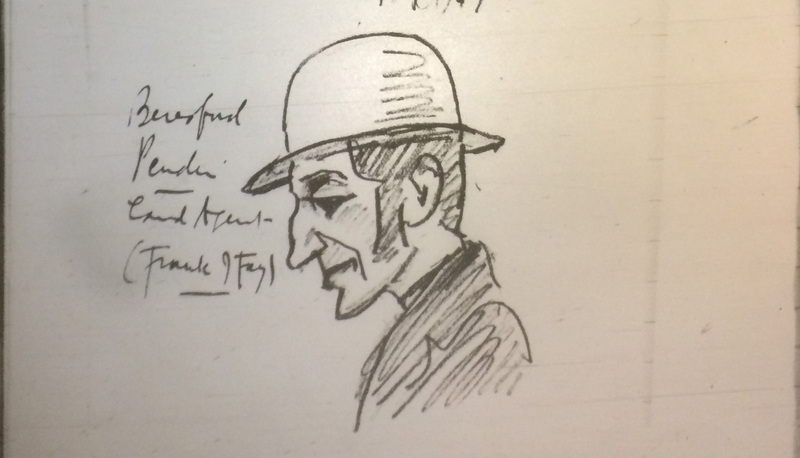 “Amusements: The Gaiety Theatre.” Freeman’s Journal 13 Jun. 1916: 6. “Bohemian Picture Theatre.” Irish Times 13 Jun. 1916: 2; 20 Jun. 1916: 7. Condon, Denis. 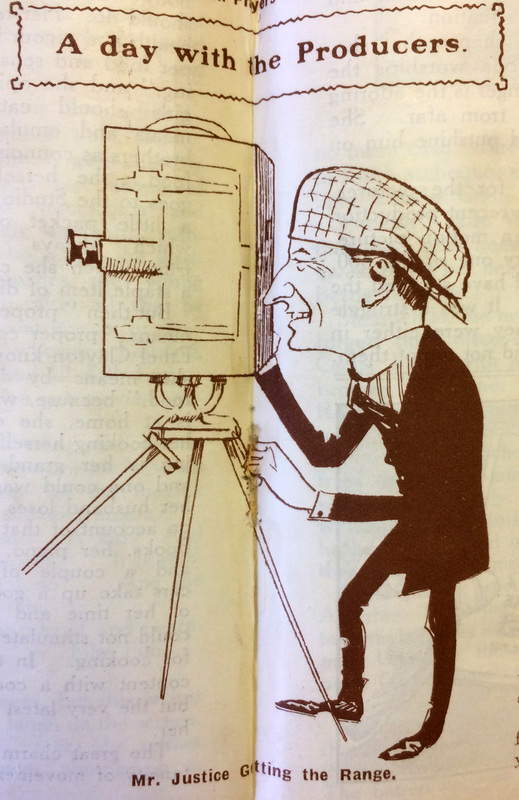 “Politics and the Cinematograph in Revolutionary Ireland: The Boer War and the Funeral of Thomas Ashe.” Field Day Review Issue 4 (2008); and “Receiving News from the Seat of War: Dublin Audiences Respond to Boer War Entertainments.” Early Popular Visual Culture Vol. 9, No. 2 (2011). 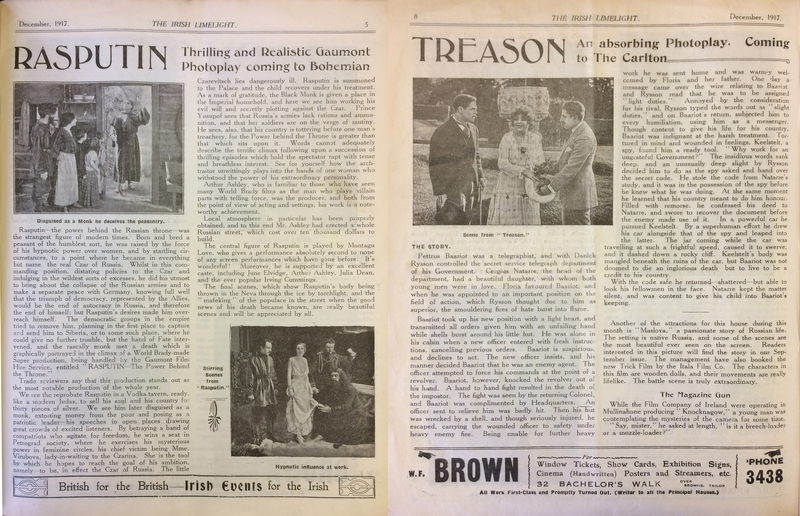 “Film Censors for Dublin.” Freeman’s Journal 22 Jun. 1916: 6. H.R.W. “Picture House Music: Its Growth and Development.” Dublin Evening Mail 28 Jun. 1916: 5. “London Correspondence.” Freeman’s Journal 16 Jun. 1916: 4. “The Moving Picture: The New National Weapon.” Bioscope 1 Jun. 1916: 955. “Pictures Taken at the Front: Splendid New Series: Operator Gets Bullet Through His Cap.” Dublin Evening Mail 22 Jun. 1916: 3. 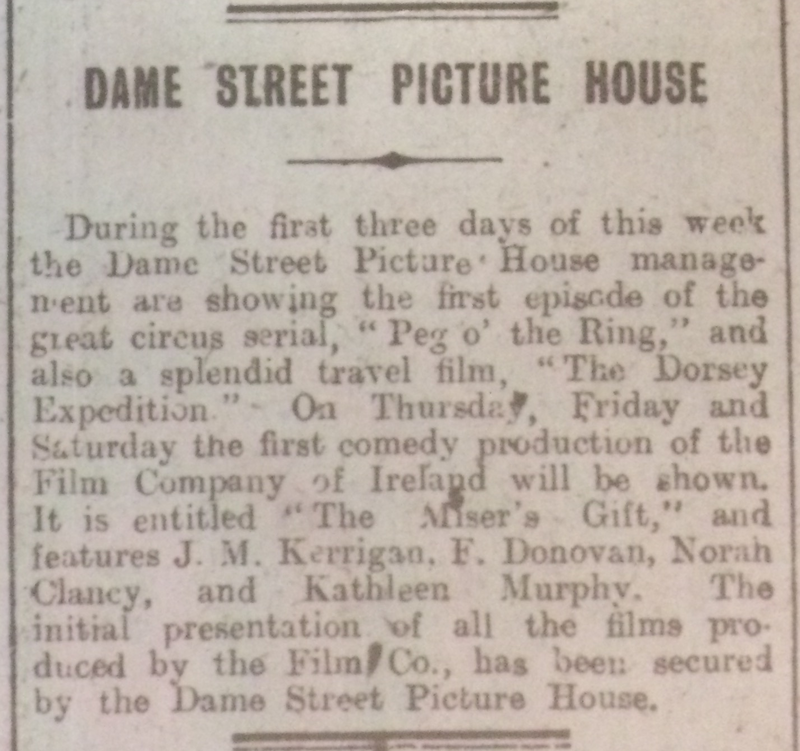 “The Pillar Picture House.” Irish Times 27 Jun. 1916: 6. “Platform and Stage.” Irish Times 24 Jun 1916: 10. “The Play’s the Thing.” Dublin Evening Mail 10 Jun. 1916: 6. 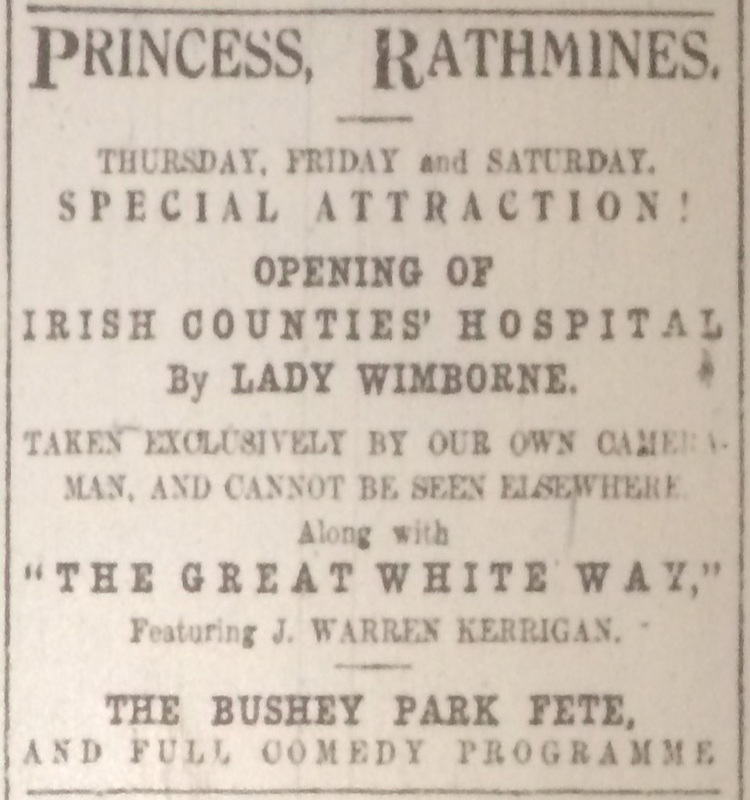 “Public Amusements: The Gaiety Theatre.” Irish Times 13 Jun. 1916: 2. “Scene in City Theatre: ‘There Is a Brave Man.’” Dublin Evening Mail 26 Jun. 1916: 4. 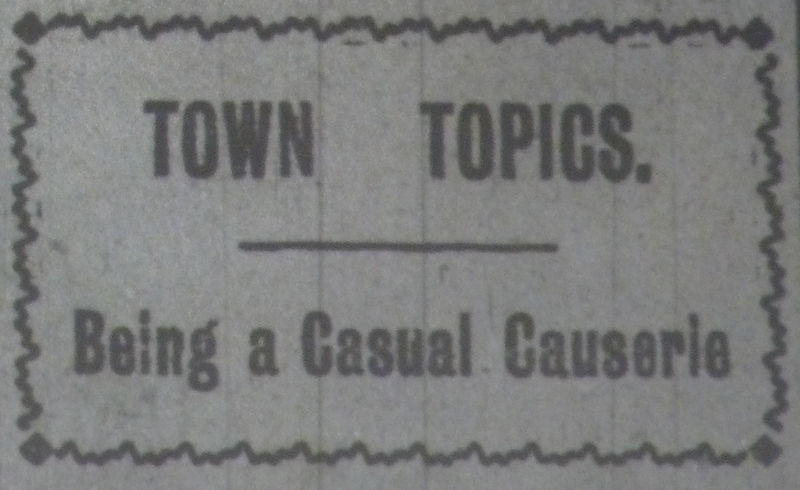 “Town Topics: Being a Casual Causerie.” Dublin Evening Mail 19 Jun. 1916: 2.